You are here: Home » Blog » Homemaking » I’m joining in the Spring Cleaning Party! I’m joining in the Spring Cleaning Party! Sound like fun? Actually, I'm so excited that it's finally here! When Simple Mom announced a couple weeks ago that she was "throwing" a Spring Cleaning party, I instantly knew I was in. I had bought her Spring Cleaning ebook about a month and a half ago, and have really been wanting to get started, but it always seemed like there was something else taking first priority (planting the garden, switching my system of organization, etc.). Well, now's the time, and I'm ready! I've actually been working ahead just a little bit, doing tasks like cleaning out my fridge and freezer, sorting through the children's clothing and cleaning under their beds, slowly gathering some of the stuff we want to get rid of, etc. so that the job wouldn't be quite as daunting when I began. I wanted to be realistic, knowing that although I feel great right now, my energy as I approach my 3rd trimester isn't quite what it would normally be. The plan for the next two weeks in my house is to take 1-3 hours each day (depending on the task at hand, and the time that I have available), and follow along with Tsh's daily tasks (here's Day 1) and with the ebook. 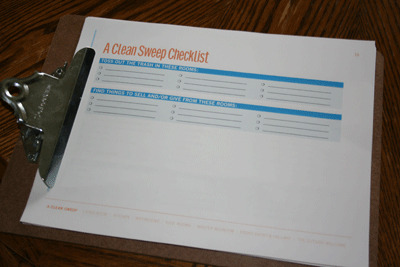 I've got my clipboard ready, and after a fun visit with my SIL and nephew this morning, I'm ready to start cleaning! Though I won't post about all of my fun adventures in cleaning, I'll try to put up a few posts and pictures along the way to show you what I'm up to. Hopefully I'll be able to show you a much less cluttered, more organized and of course, cleaner home when I'm finished! I love the idea of starting fresh each spring. Cleaning out what we don't need, simplifying what we own, getting to all of those nooks and crannies that usually get missed, and just knowing that I am doing the best I can to care for the home that God has blessed us with! Is anyone else joining in the Spring Cleaning Party? Have you already done your Spring Cleaning for the year or do you still need to get on with it? For me, I normally do some spring cleaning but its a hectic time for my husband’s job so its not really an ideal time to do it. Instead, the summers are much, much calmer so he can help with the kids more and therefore its easier to get it done. So I do most of those types of tasks in the summertime, it just makes so much more sense for our family. The ones I concentrate on right now are cleaning out the closet- getting all that grit out and cleaning the walls, eventually putting away the winter stuff and washing it first, etc. I also did a big deep clean before my baby was born, anticipating I would not be able to do as much this year since she is still so little. I was taking a quick peek at your blog before signing off Blog land for the week to focus on this very thing. Thanks for sharing this I might take look at the link to get some ideas. I am joining in the Spring Cleaning Party. It’s been pretty good so far. I am enjoying the tips from SimpleMom to get things done too! It’s really helping me out. I am following along with the eBook and doing things mostly in order, though since I don’t have any children I think many of the tasks will take one day instead of two. That will be good since I have two home offices and a dining room to get cleaned up as well. That’s a good idea. I should do that with you guys. I am doing the Spring Clean, too, but in a modified way. I am changing up some of the days to fit my schedule and I probably won’t post pics of EVERY project, but there is LOTS around here that needs to be purged, sorted, and organized. Looking forward to seeing all that you get accomplished!